Well, this is a first. Creating a recipe, photographing it, eating it then, four weeks later, sitting in a hotel room in Monterey, California – suffering with my worst jet lag to date thinking that, however brainless I feel, why not use this opportunity to dedicate some constructive time to Love the kitchen?. I have the craziest November in my life where I will away from both the home and kitchen I love for 31 days – with travel to California, Seattle, Tunisia, Luxembourg and Paris – as ever I will be relishing the opportunity to try new things which will no doubt inspire me. To the eagle-eyed, this is not my first Salade Niçoise recipe. My original version was very much in line with that I had deemed to be more traditional in terms of ingredients, then, dare I say it, an attempt at culinary rebellion followed. This time, though, I wanted to elaborate more on the origins and history of the French classic prior to just jumping into my latest revision. “Nicoise” – means ‘in the style of Nice, Provence’ – a region where olives, tomatoes, garlic and anchovies are plentiful in many of their recipes. Having revisited my version, I am shamed to say that my latest iteration is woefully lacking in all of these – mea culpa – the reason is that I was simply bereft of them in my cupboards and a trip to the town was not at all appealing. the solution? Adapt. And another reason for deviating from the classic – I really enjoy experimenting. As ever – and this is very much an approach I advocate – treat a recipe as a guide (within reason) and if you can get away with substituting an ingredient or two – you’ll be making something new, different, and potentially a significant improvement over the original. 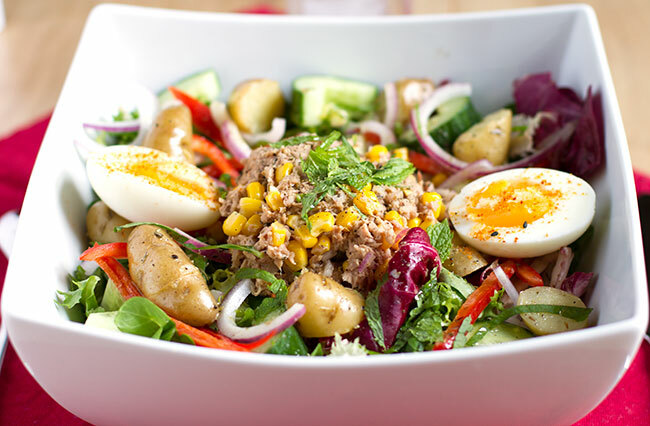 I wanted to have a second innings at this popular salad, but this time try and make it more substantial by including potatoes (to make this a more filling meal-in-one) and also omit a less than great ingredient – yes mayonnaise, I am talking to you. Many commercial offerings (although not necessarily traditional) I have had were literally drowning in the stuff- I wanted to see if I could work around this ingredient, without sacrificing on either texture or taste. Purists would argue that it should never be there to begin, however I am really going with what I have learned to typically accept. Finally- and against the grain, this Salade Niçoise with warm potatoes recipe incorporates fresh mint leaves which, combined with the potatoes offers I think offers a unique and refreshing twist to this recipe. I also dedicate this to my good friend Fred T (who I had not seen in over five years but finally caught up with in California) and other foodies I discovered in Monterey: Al, Len, and Scott (also fellow Windows fanboy). It is so gratifying for me to see how many nerds (myself included) have a passion for something which deviates so far from the day job. Place potatoes in a pan, cover with cold water, add a pinch of seas salt and a mint leaf. Bring to the boil, then reduce heat and simmer for 14-18 minutes or until cooked to your liking (I always prefer them a little on the firm side). Meanwhile, place eggs in a small pan, add sufficient cold water to ensure that they are covered, place lid on top and bring to the boil. Reduce heat, and continue to simmer for 5-6 minutes to achieve a medium boiled texture. Once cooked, drain hot water, cover with cold water, drain, then cover again to allow eggs to cool down. Once cooled down, gently crack the shell and peel. Make the vinaigrette by combining the olive oil, vinegar, Dijon mustard and mix well with a whisk. Season with freshly ground back pepper and and sea salt to taste. Transfer a third of the vinaigrette to a small mixing bowl. Add to this the finely diced red onion, non-pareille capers, tuna, and sweetcorn and combine thoroughly. Add more salt and black pepper to taste. Once cooked, drain the potatoes and add to the remaining vinaigrette with most of the shredded mint leaves. Toss through the vinaigrette and allow to cool down of for a few minutes, turning occasionally. In a large serving bowl, layer the shredded lettuce/ mixed salad leaves then scatter the slice or red bell pepper, cucumbr and red onion. 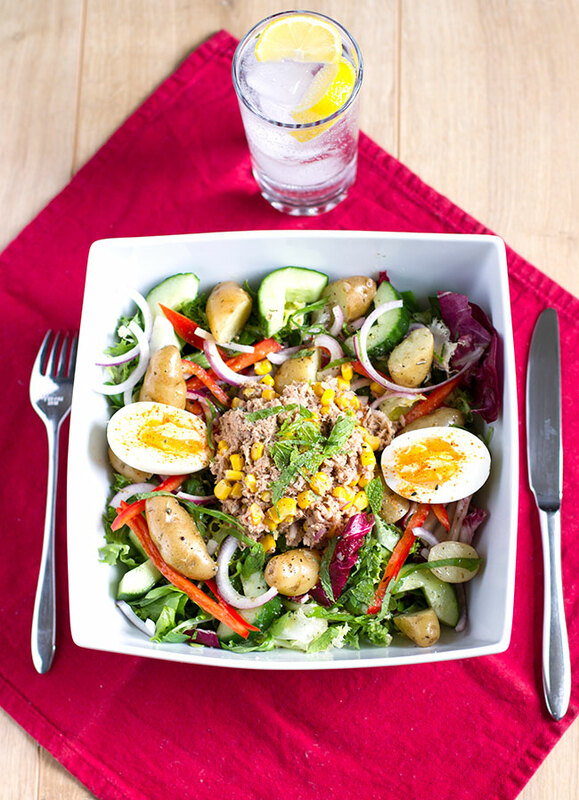 In the centre, create a mound of the tuna and sweet corn mixture ad add he remaining shredded mint to garnish. Carefully spoon the warm potatoes over the salad base, and drizzle the remaining dressing over the salad base. Finally, halve and layer the eggs on top and sprinkle with a little paprika. What you do next is entirely up to you. Incorporating tomatoes, olives, and anchovies is an obvious addition if you have them to hand. Avocado works well. Chicory too. Simply use your imagination.